The sequel to The Hunger Games, Catching Fire, started shooting earlier this month, and from the looks of these set photos, it would appear the filming is starting with some area action — even though the production is in Atlanta, not Kauai. Well, they must be doing non-water, non-jungle scenes. Here we see a behind-the-scenes photo of Jena Malone, who plays Johanna Mason. Looking good, Jena! But no one is worried about her; the big concern for fandom is the colorless Sam Claflin taking on the role of Finnick Odair, the charismatic and dashing victor beloved by many a reader. He may look the part, but can he handle the acting? Here is a look at the final adventure for the Doctor, Amy and Rory as one of the best TARDIS crews ever, “The Angels Take Manhattan.” It’s not spoilery, but does give a flavor of the episode. This is from BBC One, so not a lot of folks here in the Colonies have seen it. 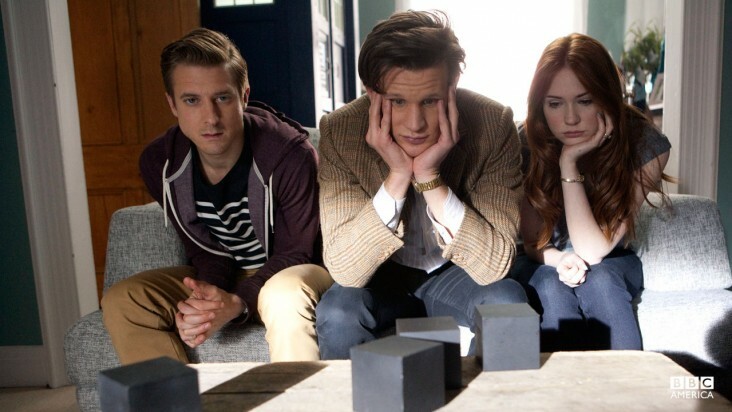 Catch the Doctor’s final journey with the Ponds on Saturday at 9 p.m. on BBC America. Is This Animated ‘Looper’ Trailer Truly Loopy? The wait is almost over for Rian Johnson’s time-traveling mind-bender Looper (It opens Friday), but the producers are determined to make that wait seem as long as possible by introducing a unique animated trailer for the flick. I know that anyone without prior knowledge of the film will not be able to make heads or tails of this trailer, but by incorporating a lot of different animation styles and constant motion and conflict, the wordless trailer gives the impression of a wild action movie with stunning visuals. I hope the real thing turns out to be just as good as this makes it look. I can hardly wait for the weekend!